1989-06-09. New. Ships with Tracking Number! INTERNATIONAL WORLDWIDE Shipping available. Buy with confidence, excellent customer service! 2001-08-05. New. Ships with Tracking Number! INTERNATIONAL WORLDWIDE Shipping available. Buy with confidence, excellent customer service! 1989-04-13. Good. Ships with Tracking Number! INTERNATIONAL WORLDWIDE Shipping available. May not contain Access Codes or Supplements. May be ex-library. Shipping & Handling by region. Buy with confidence, excellent customer service! Phoenix. PAPERBACK. 1842124471 New Condition. . New. Scribner. Hardcover. 0684191261 New Condition. . New. 1989-06-09. Good. Ships with Tracking Number! INTERNATIONAL WORLDWIDE Shipping available. May not contain Access Codes or Supplements. May be ex-library. Shipping & Handling by region. Buy with confidence, excellent customer service! New York: Charles Scribner's Sons. Fine in Near Fine dust jacket. 1989. First US Edition; First Printing. Hardcover. 0684191261 . A Fine first Printing of the First American Edition housed in an edgeworn and mildly soiled Near Fine dust-jacket; . Scribner. Hardcover. 0684191261 Please allow 4 - 14 business days for Standard shipping, within the US. Thank you for supporting our small, family-owned business! . New. 1989-09-01. 1st American ed. Scribner. Hardcover. 0684191261 Please allow 4 - 14 business days for Standard shipping, within the US. Thank you for supporting our small, family-owned business! . Fine. 1989-09-01. 1st American ed. History Book Club. Hardcover. B00D4692L0 This book is very nice condition, clean interior, the binding is tight, and is highly usable.The dust jacket is in fine condition. . Very Good. Weidenfeld & Nicolson, 1996. This is an ex-library book and may have the usual library/used-book markings inside.This book has hardback covers. In good all round condition. Dust Jacket in good condition. Phoenix. PAPERBACK. 1842124471 Like New Condition. . Fine. Scribner. Hardcover. 0684191261 Like New Condition. . Fine. Orion Books Limited. Used - Very Good. Former Library book. Great condition for a used book! Minimal wear. Quality Paperback Club. Used - Like New. Book in almost Brand New condition. Quality Paperback Club. Used - Good. Shows some signs of wear, and may have some markings on the inside. Quality Paperback Club. Used - Very Good. Great condition for a used book! Minimal wear. New York: Charles Scribner's Sons [0-684-19126-1] , 1st American edition. (Hardcover) 337pp. Very good plus in very good plus dust jacket. Photographs, illustrations, maps, references, notes, bibliography, index. There is a previous owner's inscription. Locale: ; Greece. (History--Ancient). Scribner. Hardcover. 0684191261 Please allow 4 - 14 business days for Standard shipping, within the US. Thank you for supporting our small, family-owned business! . Fair. 1989-09-01. 1st American ed. New York. : History Book Club., 1989.. Hardcover.. Fine copy in near fine dust jacket (in mylar).. Octavo.. Illustrated.. Photograph of OUR copy available upon request. Condition: Fine copy in near fine dust jacket (in mylar). New York: Charles Scribner's Sons, 1989. Hardcover. Fine/near fine. Bound in publisher's original grey quarter cloth with maroon boards and stamped with gilt on the spine. Sunning to extremities and spine of dust jacket. Guild Publishing, London, 1989. Book Club Edition. Hardcover. Fine Condition/Near Fine. Size: Octavo 8vo (standard book size). 337 pages. Text body is clean, and free from previous owner annotation, underlining and highlighting. Binding is tight, covers and spine fully intact. No foxing in this copy. The dust wrapper is not price clipped and shows only minor shelf-wear. . All edges clean, neat and free of foxing. This BOOK IS IN STOCK and READY TO MAIL NOW. Your book when ordered will be securely packed and promptly dispatched by Great Southern Books. The Golden Age of ancient Greek city-state civilization lasted from 490 to 336 BC, the period between the first wars against Persia and Carthage and the accession of Alexander the Great. Never has there been such a multiplication of talents and genius within so limited a period and Michael Grant captures this astonishing civilization at the height of its powers. Quantity Available: 1. Shipped Weight: Under 1 kilogram. Category: History; Pictures of this item not already displayed here available upon request. Inventory No: 4282. .
New York: Charles Scribner's Sons. Near Fine in Very Good+ dust jacket. 1989. Hardcover. 0684191261 . Book Club edition. This book covers the "Golden Age" of Greek classical history - from the first wars against Persia and Carthage in the 5th Century BC to the rise of Alexander in 336BC. No previous owner marks. Top page edges very slightly soiled. Very gently bumped at both ends of spine. Dust jacket is clean and bright with minor wear to edges. Ships same or next business day. ; 8vo 8" - 9" tall; 337 pages . New York: Charles Scribner's Sons, 1989. 6/9/2010. Fine/Near Fine. Book club edition. Fine in near fine dustwrapper with short nicks to the spine ends. New York: Scribner, 1989. First edition. Hardcover. Very Good/Very Good. 8vo. pp. 337, b/w illustrations. Scribner. Very Good. 9/1/1989. Hardcover. 0684191261 . This book is in very good condition; no remainder marks. It does have some shelfwear. Inside pages are clean. .
Phoenix, December 2001. Trade . 3.1 PB standard 50%. Scribner, 1989-09. Hardcover. Very Good Text/Very Good Dust Jacket. Very good hardcover with very good dust jacket. Previous owner's bookplate on front endpaper. DJ, text, boards, and binding in very good condition. Shelfwear is light. Pictures also in very good condition. London, Weidenfeld and Nicolson, 1989. Very good, clean and tight, in a near fine dust jacket. Hardback. With dj. Hard Cover. Scribners 1989. Unless Listed in this decription, VG or Better. Weidenfeld & Nicolson. Used - Very Good. First Edition. 1989. Hardcover. Very Good. Scribner. Hardcover. 0684191261 American first edition, first printing. Published in 1989. Stated first edition on copyright page. Jacket is in Very Good + condition. Front of jacket has a 1 inch tear bottom right corner. Minor wear to spine ends and edges of jacket. Jacket is unpriced. Jacket is in a Mylar cover. Covers are clean and bright. Edges are sharp. No tears or creases. The book itself is in Near Fine condition. The binding is straight and tight. No remainder mark. Previous owners name inside front cover. All books are marked down 35% until February 1, 2019. Start stocking up now! . Very Good. New York,: Charles Scribner, 1989 ". the Golden Age of Greek Civilization, the period from the first wars against Persia & Carthage in the early 5th century B.C. to the accession of Alexander the Great in 336 B.C. Never have so many varied talents & so much genius flourished within so short a period: the time of Sophocles, Aristophanes, Herodotus, Aristotle, Socrates & Plato. Much of our culture today was anticipated by the classical Greeks & their work remains fundamental to Western civilization. Focusing primarily on individuals who shaped their own & future civilizations rather than solely on political & military affairs, Michael Grant takes 37 of the great men of the age, whose contributions he considers to have been particularly important, & places them in their historical context. Grant explores the factors that gave rise to such outstanding achievement in the cultural, philosophical, scientific & literary spheres, stressing not only those of Athens & other mainland states, but also of cities far to the west & east, notably in Sicily & on the shores of the Black Sea. Writing for the general reader as well as for the reader with a more specialized knowledge of classical Greece, Michael Grant has captured the most astonishing of civilizations at the height of its powers. In this accessible & endlessly fascinating volume, he brings to life some of the most extraordinary men in all of history." 337p. plates maps bibliography.index. 1st.US Ed... Hard Cover. Near Fine/No Jacket. New York,: Charles Scribner, 1989 ". the Golden Age of Greek Civilization, the period from the first wars against Persia & Carthage in the early 5th century B.C. to the accession of Alexander the Great in 336 B.C. Never have so many varied talents & so much genius flourished within so short a period: the time of Sophocles, Aristophanes, Herodotus, Aristotle, Socrates & Plato. Much of our culture today was anticipated by the classical Greeks & their work remains fundamental to Western civilization. Focusing primarily on individuals who shaped their own & future civilizations rather than solely on political & military affairs, Michael Grant takes 37 of the great men of the age, whose contributions he considers to have been particularly important, & places them in their historical context. Grant explores the factors that gave rise to such outstanding achievement in the cultural, philosophical, scientific & literary spheres, stressing not only those of Athens & other mainland states, but also of cities far to the west & east, notably in Sicily & on the shores of the Black Sea. 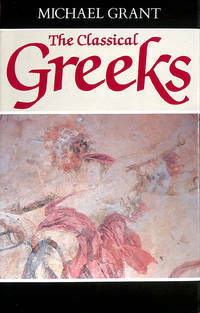 Writing for the general reader as well as for the reader with a more specialized knowledge of classical Greece, Michael Grant has captured the most astonishing of civilizations at the height of its powers. In this accessible & endlessly fascinating volume, he brings to life some of the most extraordinary men in all of history." 337p. plates maps bibliography.index. 1st.US Ed... Hard Cover. As New/As New. N.Y.: Quality Paperback Club, 1997. pp.337 with index and bibliography. clean tight copy. Soft Cover. Fine. 8vo - over 7¾" - 9¾" tall. Quality Paperback Book Club, 1997. Softcover. Fine. As new.. Originally published in 1989, this edition has a new foreword by the author. B+W plates. London: Guild Publishing, 1989. xiii, 337pp, index, bibliography, notes, maps, bw ills. Or black cloth in jacket. Some minor foxing. Jacket slightly faded on spine.. Book Club. Hard Cover. Very Good/Very Good. 8vo.